One of the first times I met my father-in-law, I was staying at his house. Jenny and I had been dating for a while (for much longer than she had admitted it) and we came home from college for a break. I spent the night upstairs in Jenny’s room while Jenny slept on the couch. I assure you there was no sneaking down (or up) stairs that night. I was afraid to roll over in bed thinking that if my future father-in-law heard anything, he might shoot me. Early the next morning, I awoke to the sound of a chainsaw. I rubbed my eyes, found my glasses, and looked out the blinds. With chainsaw in hand, he took one look, made four or five cuts, and dropped a tree in a small space between his house and my car…with the tree falling a little closer to my car than his house. The message was sent–don’t mess with my daughter because I can use heavy machinery to kill things whenever I want. From my earliest meetings with Jenny, it was clear she had a deep love and respect for her parents. As I got to know them better, I saw a man and woman who happily loved each other. Their affection and devotion for one another had a ripple effect on those around them. The greatest beneficiaries of this love were their children. Long before I ever met Bruce and Verna Palmer, they were giving me one of the greatest gifts I could receive. By loving each other, they were modeling for Jenny what a healthy marriage looks like and creating a secure environment in which she could grow. This security has an impact on our marriage today. By loving each other, they were loving me. Five years ago today, Jenny’s dad died after a brief illness. I wrote it about through the lens of Silas in Walking with My Son Through the Death of His Grandfather. Yet five years later, Bruce and Verna’s love for each other still benefits our lives. I’m under no illusion that their marriage was perfect. It couldn’t have been. Yet it does seem as though it was good. It was defined by many good memories, a bunch of laughter, and three children who grew into good adults. For this reason, I’ve dedicated Happily: 8 Commitments of Couples Who Laugh, Love & Last to them–in honor of Bruce’s memory and in gratitude to Verna’s continuing love and example. Of course, Jenny’s parents couldn’t be the only two people to whom I’ve dedicated this book. Every book must begin with the words “To Jenny.” I’ve spent the past two decades amazed that she chooses to love me and doing everything in my power to make sure she knows I love her. Of course, she might say that my love doesn’t have to be expressed in fifty-thousand word books, but instead would be made more clear if I would simply weed-eat every now and then. But yard work is not how I express my love. Instead, I want to assist others in having just a little bit of what she regularly gives to me. There are times in which I feel as though I hit the lottery. I was in love with Jenny far sooner than I should have been. I was ready for marriage for earlier than she was even willing to think about it. Making the same decisions I made, a lot of trouble could have come my way had Jenny not turned out to be as good as she actually is. At times, I feel like a hypocrite writing a book about marriage when so much of our marriage feels like good fortune or the intervention of a sovereign God who loves me far more than I deserve. Yet at other times, marriage seems pretty simple. It’s rarely easy, but it is pretty simple. Love one another. That’s the secret. Imperfectly, but consistently figure out how to love each other. That’s what this book is about. That’s what Friends, Partners & Lovers is about. We will fail. We will struggle. We will be frustrated. But we have vowed to continuously love one another and for as long as we do that, our marriage will ultimately be defined by a contentment and satisfaction which will fairly describe us as happily married. 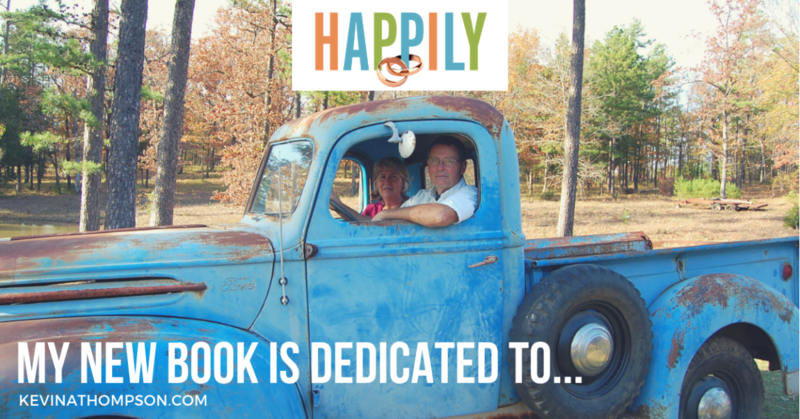 So I dedicated Happily: 8 Commitments of Couples Who Laugh, Love & Last to my in-laws and my wife. The former loved each other well. The latter loves me well. I’m grateful for all three. Knowing the kind of marriage we Palmer kids watched between our parents, it was truly Divine intervention that put Bruce and Verna together. I must say it took many interventions between Donnie and I to meet, marry and keep being married. It was only Jesus Christ who could have brought us from where each of us were when we met to the place we will be Oct. 10, 44 years of marriage. Congratulations on the upcoming anniversary. We appreciate the commitment you’ve made to each other. Touching and tender dedication. Thank you for putting your thoughts into words for us all to grow from. I love reading happy, inspiring stories of loving relationships. I’m extremely proud of our 45 year marriage, our children and grandchildren, and the joyful satisfaction we share now our senior years. I’ve got to get this book. I’m collecting “Kevin” books. LoL. I blame Verna for starting this collection. But I’m so glad she gave me the 1st book as a gift!!!! The Palmer family loves like none I’ve ever seen. I love every one of them!!!! Thank you for the way your Christian love has motivated your writing in this way for everyone.